Despite dying young in a hiking accident in the Tatra, the mountain range separating Poland and present-day Slovakia, Andrzej Wróbelwski (1927 - 1957) is viewed as a twentieth century art great in Poland. This major retrospective exhibition seeks to present Wróbelwski's highly idiosyncratic work to an international audience. It often moves between abstraction and figuration, and Stalinist socialist realism and modernism. The show mainly focuses on two important phases in his career: the beginning (1948-49) when Wróbelwski developed his own painterly language, and the end (1956-57) when, after a period of faith in socialist realism, he attempted to redefine himself. 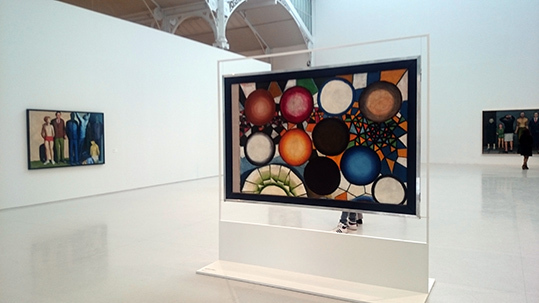 The narrative of the exhibition is based on Wróbelwski's double-sided works. Andrzej Wróbelwski: Recto / Verso. Palacio de Velázquez, Museo Reina Sofía, Madrid, Spain. 17 November 2015 - 28 February 2016. Andrzej Wróblewski: Recto/Verso from ArtworldNow on Vimeo.